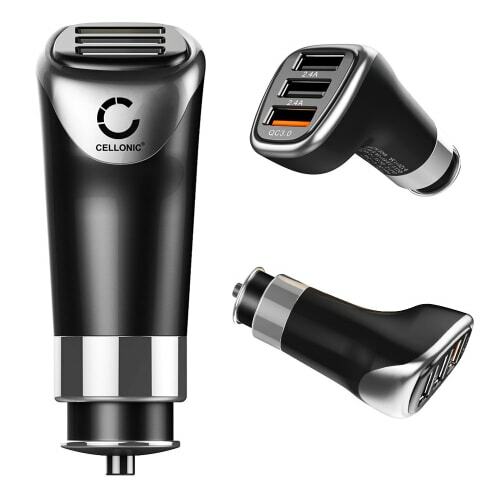 Get the most out of your devices on the go with this CELLONIC® USB Car Charger. Whether smartphones, tablets, Bluetooth headsets or MP3 players: this multiport car charger adapter supports the charging of up to three devices simultaneously via a standard 12V or 24V vehicle cigarette lighter outlet. Simply plug it in and away you go – all you need is the right USB cable for the device. In addition, one of the ports features Qualcomm QC Quick Charge 3.0 technology for fast charging of compatible devices, while the other two are equipped with Smart Charge charging technology to ensure optimal charging conditions for your end device. ✔ Simply plug in the matching USB cable for the device and start charging!